Geeky parents have been known to do some pretty great things for their kids. From staying up late playing video games together to getting awesome custom-made toys, kids of geeks have it made. 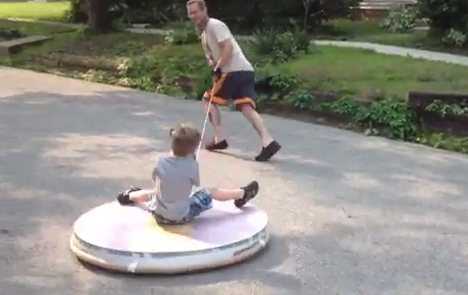 YouTuber “VideoPapa” made this crazy-fun hovercraft for his son. He doesn’t give a lot of information about its construction, but he does say it’s made from polystyrene insulation board, and it seems to sport a small blower motor. The homemade hovercraft doesn’t have a propulsion or steering system; rather, VideoPapa uses a string to steer the craft as he runs up and down the street. 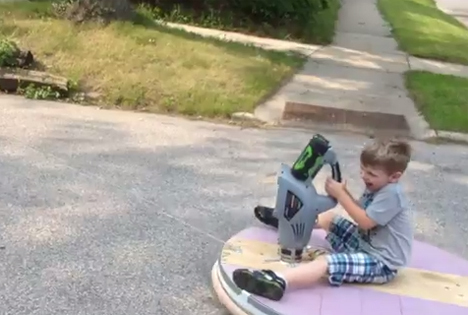 If you wonder whether a simple home-brewed hovercraft could possibly be any fun, just listen to the laughs and squeals of the little passenger in the video. Sadly, it would probably take a much larger motor to levitate a grown-up.